The real rosemary honey referred to in this article is not honey infused with rosemary. The rosemary infused or flavored honey is used as an appreciated ingredient in our cuisine, made from multifloral honey infused with rosemary. The final product is different than the real honey, which is made by bees from the flower’s nectar. Etymology: The name has nothing to do with roses or Virgin Mary. It derives from the Latin “dew” (ros) and “sea” (marinus), or “dew of the sea”. The plant is also sometimes called anthos, from the ancient Greek word ἄνθος, meaning “flower”. Plant description: woody, perennial, evergreen, aromatic, needle-like leaves and white, pink, purple, or blue flowers. The plant flowers in spring and summer in temperate climates, but it can be in constant bloom in warm climates. It grows up to 2 meters height. Native to Mediterranean regions but it is also found in Asia and Africa. Chemical composition: The leaves of the plant contain up to 2% of essential oil, which consists of cineole, camphor, borneol, limonene, pinene, camphene. In addition, rosemary contains tannins, resins, bitterness, flavonoids, plant and slightly acid saponin. Alkaloid rozmaritsin, ursolic and rosmarinic acid are also found in the leaves. The legend of rosemary explains somehow the relation between this flower and its name “the dew of the sea”. The legend is found in the Manuscript of Pliny, and explains the unusual blue color of the rosemary: the Mediterranean Sea with its foamy waves would wash the bushes of the flower and color them in blue. From here the name rosemary coming from the Latin of “dew of the sea”. The Rosemary was considered sacred by the Egyptians, Hebrews, Greeks, and Romans, and was used in the Middle Ages to ward off evil spirits and protect against the plague. In the Middle Ages, there were entire fields and meadows of rosemary stretching in France. It is said that sheep grazed there and their meat has gained a special flavor and taste. Rosemary was associated with wedding ceremonies. The bride would wear a rosemary headpiece and the groom and wedding guests would all wear a sprig of rosemary. It was perhaps the time when the monks began to collect the most valuable rosemary honey. It was produced and it is still produced mainly in the south of France and the island of Minorca. Today rosemary powder is recommended for dizziness and low blood pressure, stress and nervous tension, general exhaustion and sexual weakness. Concoction of leaves stimulates the stomach and intestines, and infusions are effective in thrombophlebitis, myocardial infarction and other cardiovascular diseases. In our cuisine, rosemary is a favorite condiment for the people living in the Mediterranean. While the plant grows uncultivated in the Crimea and the Caucasus, there are clean, dry grass, and various seasonings of rosemary produced in France, Portugal, Greece, Spain, Italy and even North Africa and the United States. While rosemary is used in some countries for the treatment of epilepsy (only in a clinical setting with appropriate medical staff) it is contraindicated in pregnancy and epilepsy. It should be used cautiously with high blood pressure. it should not be taken in the evening, as it is highly tonic. What is Rosemary oil good for? Rosemary oil has a clear, refreshing herbal smell, is clear in color, and is watery in viscosity. It is extracted from the fresh flowering tops through steam distillation, yielding 1.0 to 2.0 percent. The highest percentage of essential oils was found in plants that have reached the age of three years. Paracelsus, a German-Swiss physician and botanist, was the one who contributed greatly to the understanding of herbal medicine in the 16th century. He was the first to valu rosemary oil because of its entire body-strengthening ability, such as the healing of sensitive organs like the liver, heart, and brain. Grass of rosemary is the most actively used for medicinal purposes. Shoot tips are cut before flowering and quickly, and carefully dried. (The best way to dry rosemary – under the eaves in a ventilated area.) The drying temperature should not exceed +30-35 ° C (86-95 F), otherwise it will lose an important component of rosemary – the essential oil. What are Rosemary Oil health benefits? • Helps in indigestion – Rosemary oil is often used for this relieving flatulence, stomach cramps, constipation, bloating and in stimulating appetite. 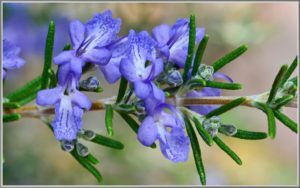 • Detoxifies the liver: New research shows that rosemary essential oil can help detoxify the liver and regulate the creation and release of bile. • Decreases stress – Rosemary oil is been shown to decrease the level of cortisol, one of the hormones released during the body’s flight-or-flight response to stress, in the saliva. (according to the 2007 study “Smelling lavender and rosemary increases free radical scavenging activity and decreases cortisol level in saliva”) shows that merely inhaling this oil for 5 minutes will significantly reduce cortisol levels and thus the stress. • Relieves pain – Rosemary essential oil is used to treat headaches, muscle pains, and even arthritis. ( see the 2010 study). Massage the affected area with the essential oil. Its anti-inflammatory qualities also make it useful for the pain of sprains and joint aches. • Boosts the immune system – Simultaneous massage and inhalation of rosemary oil showed that free radical-scavenging activity in the subjects’ bodies also significantly increased. (according to the same 2007 study mentioned above). • Helps in respiratory problems – The scent provides relief from throat congestion, and is useful for lots of respiratory allergies, colds, sore throat, and the flu, probably due to its antiseptic and antispasmodic effects. • Rosemary oil is beneficial for hair growth – It also reduces split. It usually combines very well with lavender oil. Rosemary honey is typical from the Mediterranean regions, mainly France and Spain. With a unique taste it distinguishes itself from other honeys. But the production is rarely the same, as it depends a lot on whether conditions from the end of the winter and beginning of the spring. The pollen of Rosmarinus is under-represented. No more than 10%. Read more on the composition of honey: Enzymes, Antioxidants, Vitamins, Polyphenols. It has tonic properties, is used in loss of strength, with neuritis and colds. Good anti-inflammatory. The Romans loved the rosemary honey and consider it the best type of honey in the world. 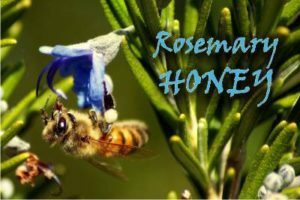 Romans considered rosemary honey a symbol of love! · It is a powerful tonic, recommended to children and old people. Also good for workaholic persons. It is beneficial and therefor extensively used in cosmetics, as an important moisturizing active. · Combined with garlic and skimmed milk, it reduces sperm deterioration. A study from 2015 evaluated the effects of rosemary honey as energy source and cryoprotectant in combination with garlic as a natural antibiotic on the quality of ram spermatozoa upon cooling. The results show that the addition of honey and garlic reduces sperm deterioration when stored at 4 degree C.
Where can I buy real rosemary honey from? If you travel to the Mediterranean areas of Europe, you can find at the locals. Or you can find it online on some Italian or Spanish shops. Amazon.com doesn’t have it, but you can find on Amazon.co.uk. Be careful and check the product before buying. Some of them are not trustful. If at the “Manufacturer reference” we see: “暂无”, stay away from it. If it also says the jar contains “natural, flavored honey” – don’t buy it. The honey is only infused with the plant and not made from the nectar of it. Also the flavor should not be too strong, again, it would mean it is polyfloral honey infused with the plant. Or, you can try other online shops, like Savannah Bee Company or Miel Es Honey. 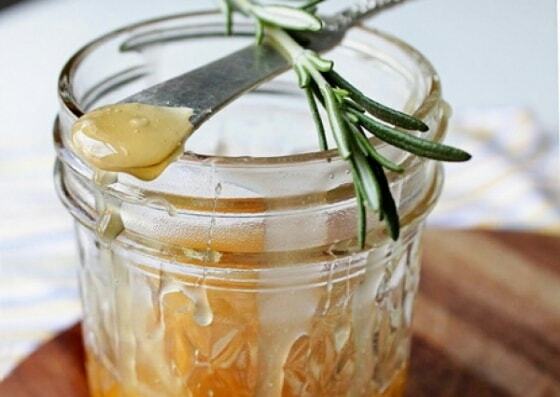 How to infuse regular honey with rosemary? Any type of raw or pasteurized honey may be used in rosemary infused honey. it can be easily made at home by combining honey, water, and fresh clipped rosemary sprigs in a saucepan. Warmed the above mixture to encourage a better blending of flavors, but do not boil it, as this can cause the natural sugars of the honey to begin to crystallize. Removed from the heat and left to come to room temperature for 15 minutes or more, depending on the level of the desired flavor. The longer the honey is allowed to sit, the deeper the rosemary will blend into the honey. It is more often used commercially and it simply means leaving the mixture age for a period of several months, to allow the flavor of the rosemary sprigs to fully seep into the honey. This also allows natural pollen to remain in the mixture. This type of cold infusion is often available from organic farms that do not use pesticides or chemicals near their bees or herbs. Where can we use rosemary honey in our cooking? In a wide variety of cooking recipes. In salad dressings and sauces for vegetables. Meat can be created using rosemary honey. It may be drizzled over desserts and fruit, and used in coffee and tea for a sweet and tangy flavored addition. When combined with lemon and olive oil, it may serve as a marinade for pork, chicken, and shellfish. Reserved marinade can be brushed over meat during the grilling process to lock in moisture and preserve flavor. Dandelion honey benefits – another way to naturally reduce gastric acidity Honey cappings make the best healthy chewing gum! Ever!